Use a warm-up routine to assess students and inform your lesson for that day. Try Kahoot! Students can self-assess by making quizzes for themselves and each other. Try Cram or Quizlet. Give students a rubric or scoring checklist to use to provide direct feedback to peers. Explicitly point out what’s done right and what is off track; prompt for ways to correct. Check out this 5-minute video, “My Favourite No: Learning From Mistakes”, to watch how the teacher uses mistakes to quickly clarify concepts using formative assessment strategies. It takes place in a grade 5 class, but it still counts as a good lesson for us over here in college. Way back in week 7 of this semester, we briefly looked at the rubric tool in D2L and how to set up a rubric. 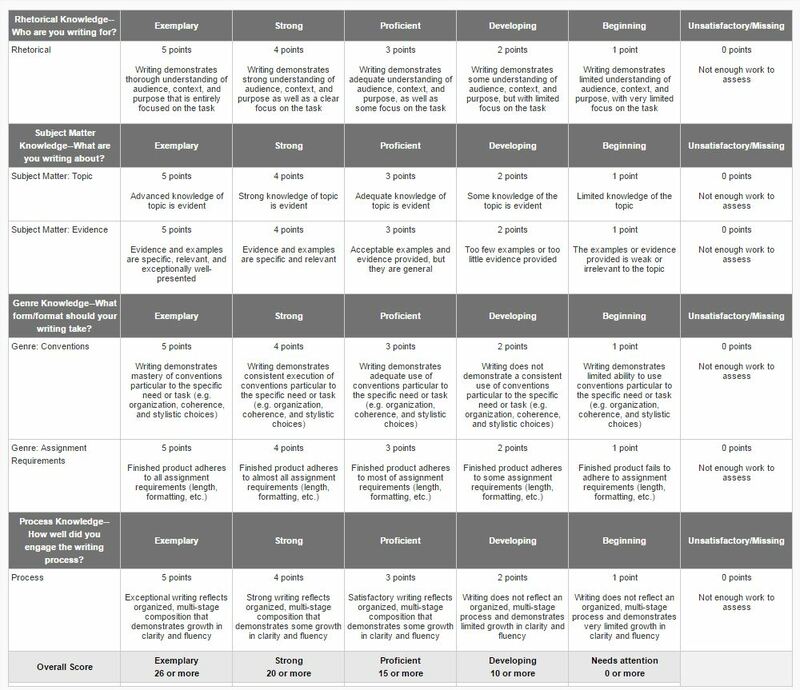 While searching the interwebs for an interesting rubric tool, we stumbled upon iRubric, and thought we would share it. It boasts itself as the “Build, Assess, Share, Collaborate” community for online rubrics; we thought it was worth a look. Maybe it’s because we “sprang forward” into daylight saving time a couple of weeks ago, but the end of the semester seems to be rapidly approaching, and some students may start looking for information on the Academic Appeal process. Of course, not your students, because you’ve promoted open dialogue throughout the semester, and you’ve stuck to your course outline! But for those students who are still looking for the information, you can easily provide it by directing them to the Academic Appeals Policy & Procedure website. There, they will find the grounds required to launch an appeal, the forms they will need to do so, FAQs, a timeline, and as you can see in the picture over there to the right, a handy visual about how it all goes down. If you somehow can’t read the picture of the handy visual to your right, click here to see it a little more bigly. Heads up! Your course outlines for the spring semester are due by the start of Week 14 a.k.a. Monday April 10, 2017. If you have questions about your course outlines, check out the How-to Guides and the FAQ from Academic Operations. Aboriginal Student Services would like to let you know about Indigenous Perspectives Designations. The purpose of the Indigenous Perspectives Designation (IPD) is to provide students who choose to access this optional learning with a more in-depth knowledge of Indigenous (First Nations, Métis and Inuit) peoples, their cultures, histories, traditions, and contributions to our shared society. The programs that offer the IPD include Social Service Worker, and Ecosystem Management Technician and Ecosystem Management Technology programs. To learn more, check out this link. What the message is trying to say is that we’d like your involvement in preparing and delivering the Teaching & Learning Day on May 3rd. Whereas the last T & L Day in February focused on learning outcomes and activities, this one will focus on learning materials and assessments. We will buy you a coffee and maybe even ask you what you want in it. Let us know via some sort of messaging system like email (LDSTeam@flemingcollege.ca), phone (ext. 1216), or in-person talking if you’d like to help develop and deliver a session. The disposable coffee cup; not sustainable. So is now . The filing cabinets for college departments may be ageist, so is… well, it’s still that because we couldn’t think of anything else. Ideas? The thumbs up icon, we learned, can be construed as offensive in some cultures. We certainly don’t want that! So instead, we’ve used a transmission tower, since, in the Services for Students section we are letting you (the faculty) know about things we hope you will re-transmit to students.